The Black-Eyed Susan is one of my favourite flowers so I thought it was time to create the pattern for that "little bit of sunshine". For the most part in this pattern, I have used the "sew and flip" method of making the triangles in the corners of many of the patches. But -- you don't get off easy for the whole block! 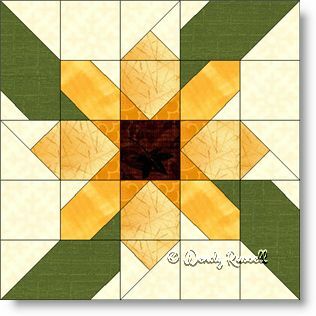 You will utilize some cut triangles -- using quarter square triangles and half square triangles together to create a patch that many quilters call the three quarter square triangle patch. So, all in all, this five patch quilt block is a learning experience for novice quilters. The two sample quilts illustrated are designed using standard quilt layouts -- a side by side setting as well as an on point setting of the blocks.